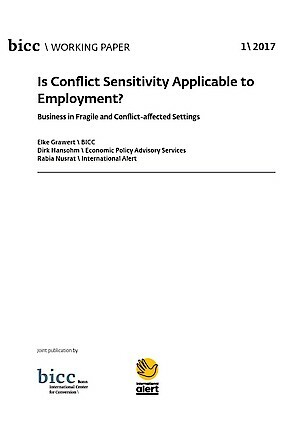 BICC Publications/Is Conflict Sensitivity Applicable to Employment? You are here: Home » Publications » Is Conflict Sensitivity Applicable to Employment? “Conflict-sensitivity” is a catchword that addresses business practices in environments of armed conflict. The United Nations Global Compact and international finance institutions are devoting efforts into convincing companies to comply with principles aiming to provide the private sector with a role in peacebuilding. They portray employment creation as a key factor in attracting young people away from joining armed groups. This Working Paper introduces the term “conflict-sensitive employment” in order to shift the focus towards the job-related role of private business in conflict environments. A critical analysis of relevant documents and scholarly debates reveals major dilemmas. The almost complete absence of a regulatory state in the fragile and conflict-affected settings (FCAS) where protracted violence usually occurs contradicts the principle of the rule of law. The profit-orientation of investors and companies venturing into business in FCAS primarily remain profit-oriented, which tends to eclipse efforts towards decent employment. Workers may prefer offers provided by the war economy over civilian employment if it does not open up a long-term perspective. The Paper identifies two disparate narratives underlying the debate: The liberal peace ideal with its presumption of a harmonious society informs approaches to assign peacebuilding tasks to the private sector. A political economy perspective reveals that corrupt states and governments are an integral part of political marketplaces organized in the interest of businesspeople and competing powerholders. The tentative result of the analysis is that conflict-sensitive employment may be possible if it pays. Empirical research at the micro-level in FCAS is required to clarify if conflict- sensitivity is a viable approach.